A well-used wooden table, set for four in the middle of a farm yard, with mismatched plates, battered crockery and crumpled, earth-toned linens. 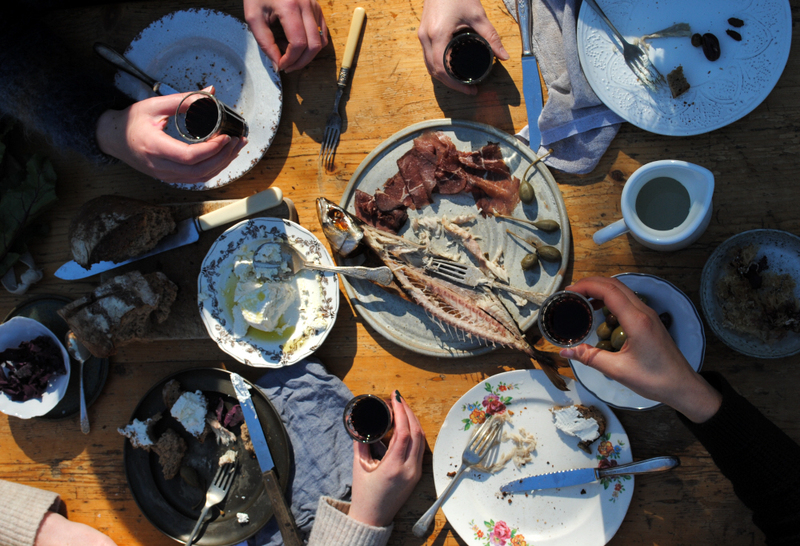 Food gathered at the English Market – a whole smoked mackerel, sweet Toonsbridge buffalo ricotta, Tom Durcan’s spiced beef carpaccio – alongside small tumblers of red wine and a torn loaf of sourdough. Nine cameras at the ready. And a rickety step ladder. 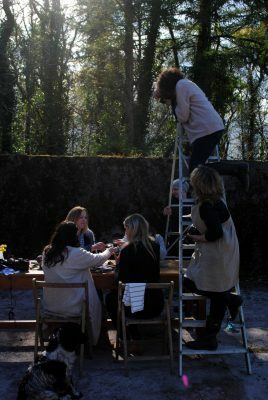 We were at the very lovely Ballyvolane House for the Lens & Larder Market + Gather food photography and styling workshop. 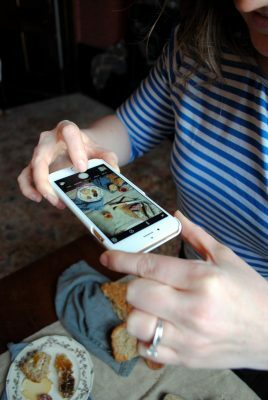 There were Insta-eye-catching meals, photogenic butter making and camera-ready foraging but – which comes first, the food or the photo? Our teacher was Dutch photographer Renée Kemps, who has worked with Food52, Vogue Magazine and Yotam Ottolenghi. 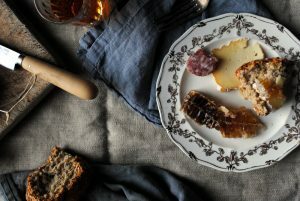 For her, it is as much about sharing the food as it is about sharing the story through photography. 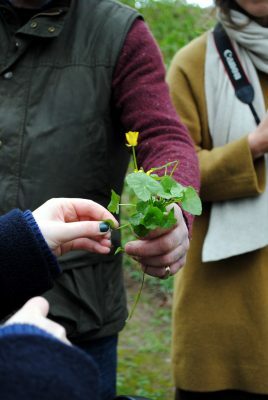 And so we did, passing plates as we discussed ISO, eating sea kale while we took shots of our dinner, tasting lesser celandine leaves while foraging with Ballyvolane’s Justin Green and our cameras. There was a lot of food and photography and learning – and the occasional ghost story! – to share. 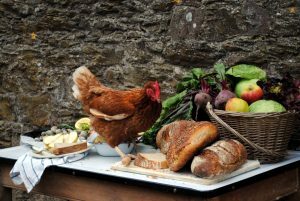 Listen to what Renée had to say about falling off ladders and chicken wrangling, all in the efforts to get a good photo of her dinner on the link below. Thanks to @deeswholefoods, @susanjanekitchen, @katemurphyphoto, @takingamomentintime and @hollywulff for providing some rather nice background sounds! If you want to up your own photography game, the Lens and Larder team run workshops a couple of times a year – find out more at lensandlarder.com. Thanks to organisers Imen and Cliodhna for the invitation to participate in the workshop. 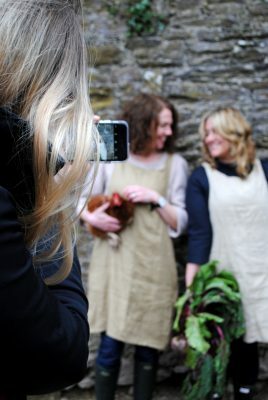 They’ll be at the Ballymaloe Litfest on Sunday 22 May, tickets available here. Come and join me in the Garden Tent to talk cookbooks! What cookbook do you love? Hate? Use all the time? Never cook from but refuse to part with? We want you to tell us all about your cookbook experiences, the most stained, tattered and dog-eared book in your collection and your pivotal cookbook moment. Bring along your favourite/most detested/crappiest/best cookbook to the Big Shed and speak to us and all the other cookbook fanatics about it for a whole two minutes. Open to everyone – even if you don’t have a cookbook!